…and to celebrate we have launched a poster campaign featuring local people who have supported us during our first year! As your independent consumer champion for both health and social care in Dudley borough, we are listening to your views and experiences and sharing them with people who make key decisions about our health and wellbeing. This means that if local people have got something to say about hospitals, care homes, doctors surgeries, opticians, dentists or any other health or social care service – good or bad, we will listen so that your views can be heard and taken into account. We are hoping that our friends and partners will help us to spread the word about Healthwatch Dudley by displaying our posters and flyers. If you are able to help in any way, please let us know and we will arrange to get some publicity materials to you. 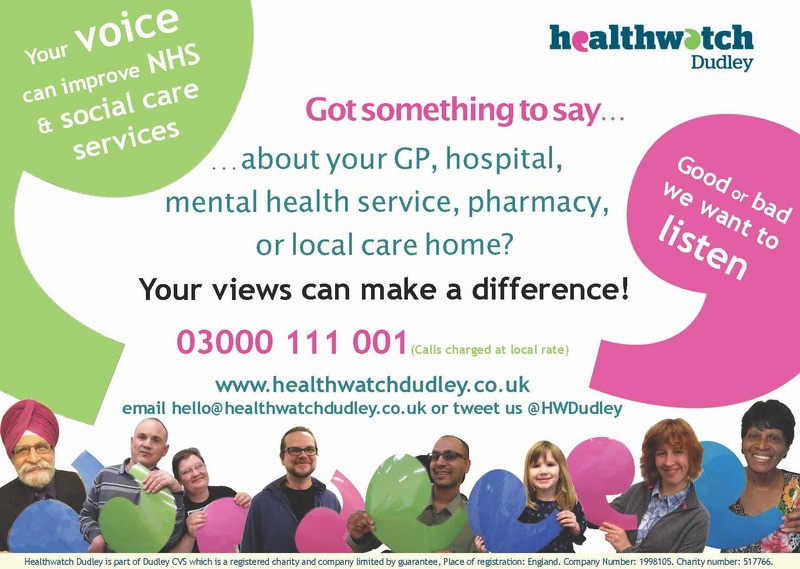 And if you would like to find out more about what we do, please give us a call on 03000 111 001, email hello@healthwatchdudley.co.uk, tweet us @HWDudley or send a request through our website www.healthwatchdudley.co.uk. We would love to hear from you. Extended versions of our posters featuring even more local people will soon be appearing on local buses, you can download our poster here and if you spot one when you’re out and about, please tweet or email us a picture and let us know what you think! Finally, we would like to say a massive thank to our fantastic poster stars, Gurcharan, Julie, Maurice, Neil, Sharon, Rachel, Steve, Matt, Josh, Sandra, Emilia and Marva who gave their time to feature in our campaign. This entry was posted in Uncategorized and tagged celebrate, decisions, dentists, doctors, Dudley, experiences, health, Healthwatch, independent, listening, opticians, social care, Support, surgeries, views, wellbeing on April 9, 2014 by Healthwatch Dudley.